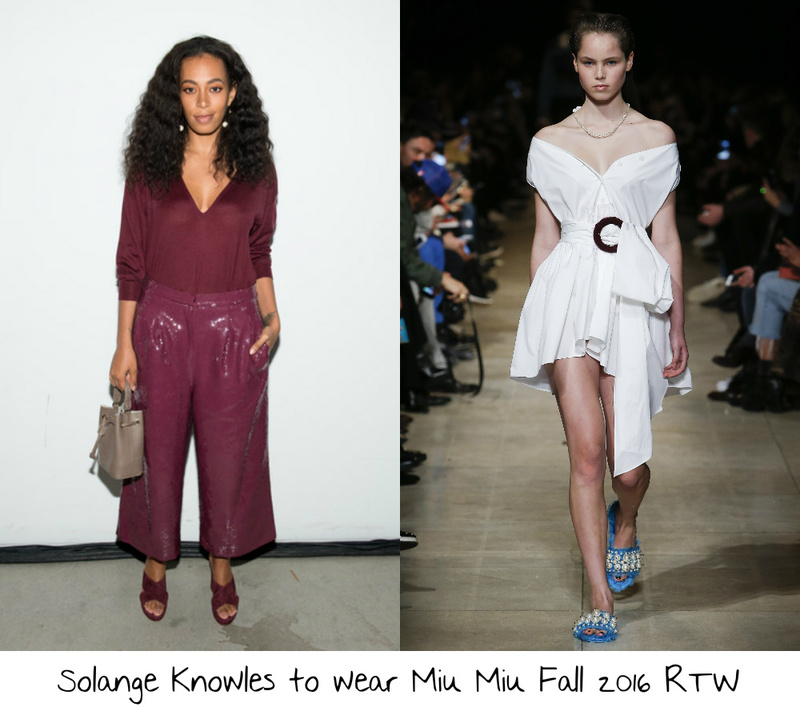 As I was pinning the different collections Fall 2016 Couture collections I seemed to put Solange Knowles’s name with quite a few looks that I am hoping have some major red carpet moments. Since I usually don’t get a heads up when Solange is going to be on the red carpet I decided to make my wishes a little more formally. 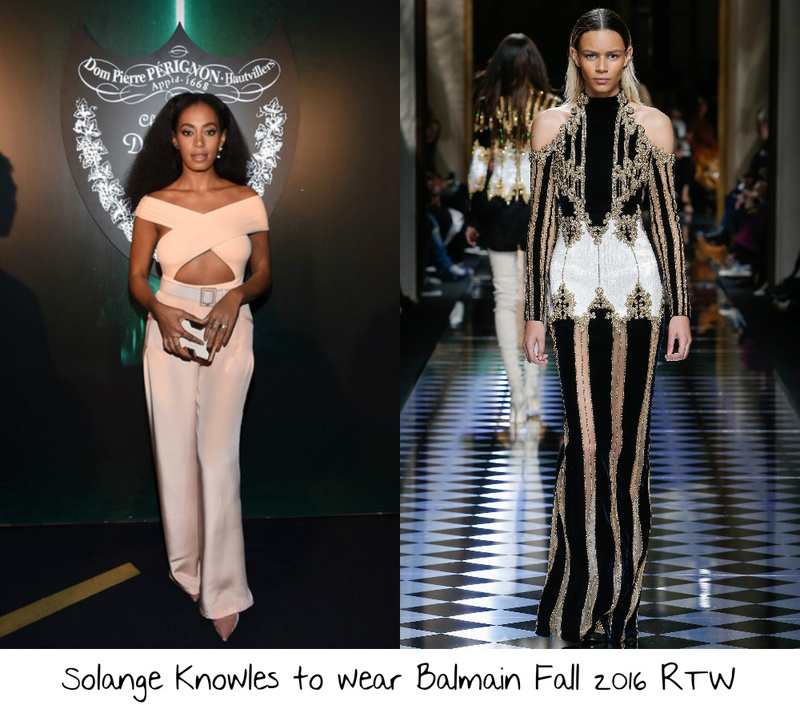 Up first is a wish for Solange to wear the Balmain Fall 2016 RTW collection. Solange has sat front row at Balmain shows before and worn the houses H&M collection but has never joined the #BalmainArmy wearing the main collections. I think this black, gold, & white Balmain Fall 2016 RTW baroque cold shoulder long sleeve gown. I was not a fan of most of this collection and this was one of the few looks from the collection that I actually really liked. I think that Solange could take this gown and make it a major modern moment on the red carpet. I can picture Solange wearing this gown on the red carpet with her hair in an afro, a red lip, black clutch, and a pair of black and gold Giuseppe Zanotti sandals, making it a major red carpet moment. 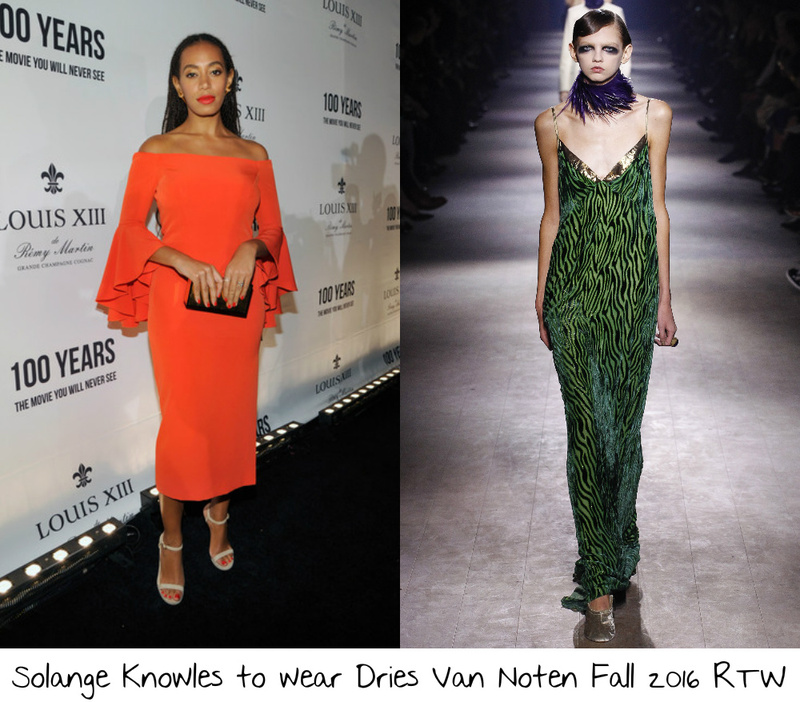 The next look is from the Dries Van Noten Fall 2016 RTW collection, which was among my favorites of the whole season. I picked this green zebra print gown, which features gold detailing, from Dries Van Noten because it is something that SCREAMED Solange the moment I saw it. I think that Solange would work the hell out of this for some sort of more casual/tropical gala and end up on a Best Dressed of the Year list. I would love to see Solange style this look with a bun of braids, natural faced makeup, gold set emerald earrings, a gold clutch, and a pair of gold sandals would make for this to be a major red carpet moment. Gucci is the hottest thing right now but yet Solange (a major fashion player) has yet to wear one of the creations under current creative director Alessandro Michele. 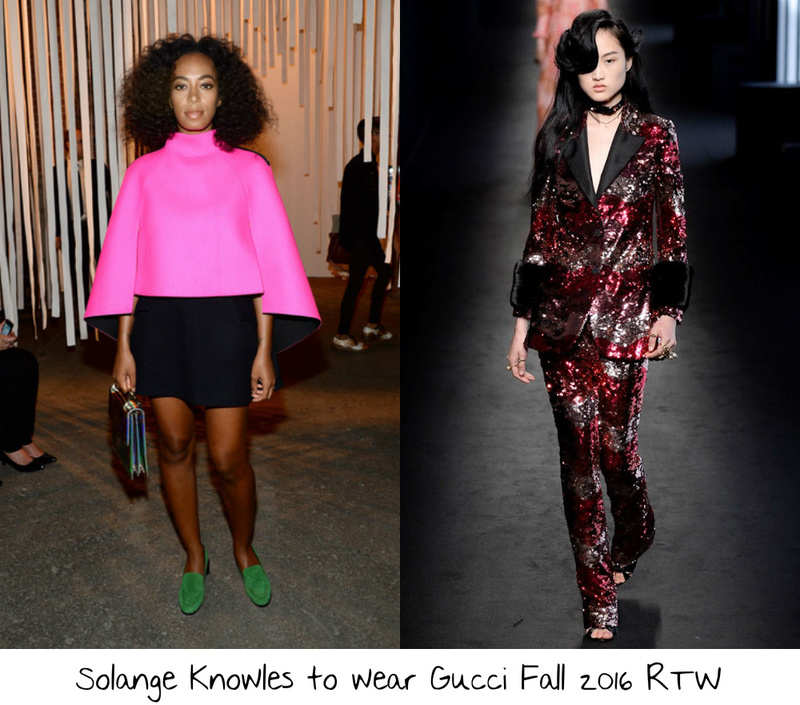 I would love to see Solange take to a red carpet wearing this fun pink sequined Gucci Fall 2016 RTW pant suit with fur cuffs. This had to be one of my favorite looks from the collection and honestly also one of my favorite Fall 2016 looks altogether, and I think that Solange has the type of look that would just make this come to life on the red carpet. With it being so busy I would love to see Solange with just her natural afro, a black clutch, and a pair of black pumps to ensure that this is a great red carpet moment. The only casual look on this list is this awesome rendition of the men’s shirting trend from the Miu Miu Fall 2016 RTW collection. I have to say that I am loving this deconstruction and reconstruction of the classic men’s dress shirt. I know many women that love taking their boyfriends dress shirts and turning them into haute looks and with this Miu Miu dress they don’t have to do the work. This would be perfect for a casual fundraiser or during fashion week for Solange. I would love to see Solange pair this look with a pair of silver Prada metallic leather pointed toe pumps with a Swarovski crystal broach on the toe, a red lip, and her natural curls to ensure that high glamour meets the casual nature of this look to give Solange a killer red carpet moment.